Precision and accuracy are our middle names! Small part machining requires close tolerances and measurements that often cannot be completed with the naked eye. Laser measuring, 3D microscopes and Automated CMM inspection technology help ensure precision and accuracy, which is extremely important for industries such as aerospace, military and the government whose parts absolutely must be delivered to specifications. Close tolerance machining must be performed using the right equipment that is properly maintained. Inferior equipment or equipment that is not maintained may result in inaccuracies that could prove detrimental to any small part machining project. JW Machine has the right equipment and tooling for close tolerance machining and keeps it and properly maintained. Our equipment calibration inspection meets ISO 10012-2003. The best equipment in the world will not perform to standards if it is operated by unqualified staff. 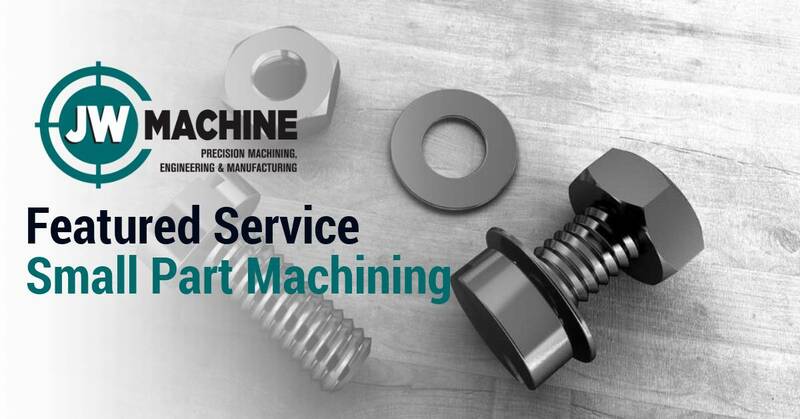 JW Machine’s staff is all expertly trained journeyman CNC machinists and proficient in all aspects of CNC machining including small part machining. Before you hit the Internet to search for “CNC machinist near me”, consider first scheduling a call with one of our precision CNC machining experts. We are happy to discuss your project and even give you a tour of our CNC machine shop. JW Machine is prepared to earn your business for years to come. Give us a call today!